Over the past three years, my relationship with food has significantly improved. I am no longer afraid of carbs, I no longer binge eat at night, I no longer live to eat, but rather eat to live, and I no longer use food to feed my emotions. And the best part – my blood sugars have never been better. I always struggled with what the “right diet” to manage my diabetes was until I adapted the “bio individuality” approach. This approach means that there is no one right diet that works for everyone and we all must move towards what makes us feel nutritionally supported, energized, and in control of our blood sugar numbers. That being said, I do believe that regardless of whether you decide to eat high fat, high carb, animal products, or not, the bulk of all of our diets should be whole, unprocessed foods. Through trial and error I’ve learned what works for my body. I do not eat meat or dairy and I eat a high carb, low fat diet. Last week I tracked everything I ate for one day and wanted to share it with you today! 7:15 am: I woke up with a fasted blood sugar of 100. Perfect start to the day! Before breakfast I drank 1 warm cup of water with lemon to kick start digestion and hydrate the body. 8:00 am: Breakfast time! Today I was in the mood for some Blueberry Pancakes. I blended up 1/3 cup oats, 1/3 cup egg whites, ½ tsp baking soda, 1 tsp vanilla extract, ½ mashed banana. 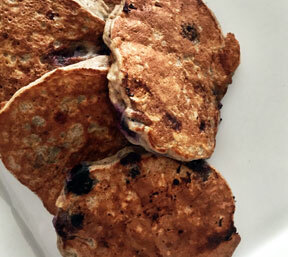 After that I folded 1/2 cup blueberries into the batter before cooking them on a heated skillet. This is a totally guilt free recipe. 10:15 am: My body works best when I eat small meals every 2-3 hours. 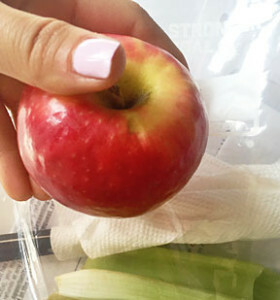 Today my mid-morning snack was 1 pink lady apple + 4 celery stalks. 1:00 pm: After one hour of cardio and weight training I ate a post workout lunch that had a balance of healthy carbs and protein. 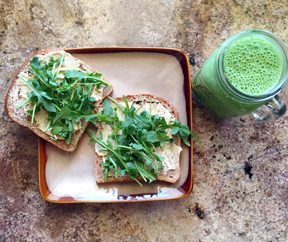 This included 1 green smoothie (1 banana, 1 cup almond milk, 1 scoop Vega Protein Powder, 2 cups spinach, and ice) + 2 slices of Ezekiel bread with hummus and arugula. 4:00 pm: By 4pm my energy levels are still up but I start craving sugar. 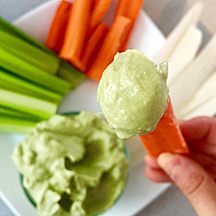 Instead of feeding the sugar craving I drank 2 large cups of water followed by carrot sticks dipped in guacamole. It did the trick! 6:30 pm: For dinner I met my family at a café. I try my best to not use eating out as an excuse to “fall off the wagon”. I looked up the menu ahead of time and was thankful for the healthful choices! 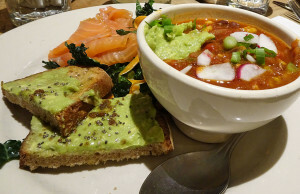 I ordered a plate with avocado toast, 1 cup of vegan three bean chili, and massaged kale with smoked salmon. Eating healthy does not have to mean restriction. It’s all about intuitively finding what works for your body and making decisions based off that to feel empowered. What is one step you can take today to move towards intuitive eating? Did anything surprise you about my food diary? If you have any questions or comments please click the “Leave a reply” link at the top of this post. Thanks. Lauren Bongiorno is a Type 1 Diabetic, Diabetic holistic health coach, qualified yoga instructor, and motivational speaker. Lauren has lived with Type 1 Diabetes since 2000 and has proven that no matter what your challenge in life is, taking control of it starts from the inside out with a healthy mind and body. With a background in holistic health, personal training, division 1 collegiate soccer, and yoga, Lauren is the Brand Ambassador for Gluco Perfect. You can connect with Lauren on her website at laurenbongiorno.com and follow her Instagram and Facebook pages for daily inspiration. This entry was posted in Blog and tagged afraid of carbs, bio individuality, blueberry pancakes, diabetes, Food choices for a diabetic, food for a diabetic health coach, food that will keep me energized, food to keep your blood sugar numbers under control, gluco perfect, green smoothie, healthy eats, high carb, importance of eating whole and unprocessed foods, joy mernone, lauren bongiorno, low fat diet, protein powder, type 1 diabetic, Type 2 Diabetic, what do do when i have a sugar craving, what to eat if you don't want to eat meat or dairy, what's the right diet for me on March 25, 2016 by Gluco Perfect. 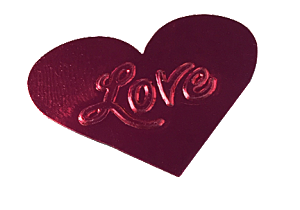 Last month’s Valentine’s Day had me thinking about how chocolate does not have a very good reputation in the Diabetic community. It is invariably put on the “bad food” list and often only eaten during cheat meals, holidays, or unplanned nighttime binges. From what I’ve observed, many diabetics are convinced that chocolate does not do KIND things to their blood sugar and so they try to stay away from it even though they love the taste and wish they could have it more often. What if I told you though, that I’m a diabetic, and I not only eat chocolate almost every single day, but I do so without spiking my blood sugar? Chocolate is not the enemy. In an article published on Mind Body Green, “3 Healthy Reasons To Eat Chocolate Every Day,” naturopathic physician Michael Murray explains the many great benefits of eating chocolate. According to Murray, chocolate is a rich source of flavonoid antioxidants that are important in protecting the heart, chocolate produces arginine that helps regulate blood flow and blood pressure, and chocolate helps to prevent excessive clumping together of blood platelets that can cause blood clots. Plus, it tastes DELICIOUS! So why not learn how to incorporate it into your diet more without it affecting your blood sugar? From my experience and observation, I’ve learned that diabetics and chocolate do not mix well when the wrong type of chocolate is eaten, and in large amounts. So what’s the right type of chocolate and how do you manage to not overeat it? Oh, I’m so glad you asked! The right type of chocolate is one that does not have both high carbs AND high fat. That’s a disaster waiting to happen. The high fat will block the insulin from treating the carbs, and you’ll be left with a spike. Most candy bars, milkshakes, and restaurant desserts are HIGH FAT and HIGH CARBS. You’ll want to select a chocolate that has either high fat/low carb or moderate carb/low fat ratio. When we look at how to have self-control when eating chocolate, think of the “don’t touch the cookie jar” phenomenon. When someone says, “don’t touch the cookie jar” it’s equivalent to “don’t eat chocolate during the week” or “no chocolate this month during my diet”. Restriction just wants to make you have it more! I allow myself to have chocolate every day so my body doesn’t feel like the one time a week I allow myself to have it I need to stuff my face and go overboard. It’s about moderation. Below are three recipes to make at home as a way to start sneaking chocolate into your diet more often without having the negative effects of high blood sugar! Directions: Melt the nut butter in the microwave for a couple of seconds. Then, combine all ingredients in a bowl and mix them together. 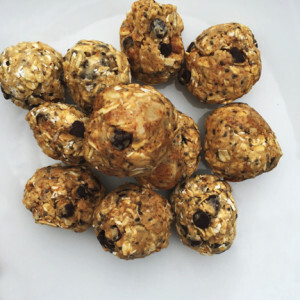 Roll into balls, place on a plate or tray, store in fridge and enjoy! Directions: Mix dry ingredients in a large bowl. In a separate bowl, whisk together brown sugar and melted coconut oil. Whisk in beaten egg, milk, and pureed zucchini. Add wet ingredients to the dry ingredients and whisk until just combined. Stir in chocolate chips. Pour about ¼ cup mix per waffle and cook according to waffle iron instructions. Directions: Melt chocolate and oil on stove top on low heat while continuously stirring (It’s really important not to let the chocolate burn!) Spray oil inside of baking liners (I used a coconut oil spray from Whole Foods®). Add a tiny bit of chocolate to the bottom of the liner (this is your bottom layer) and place in freezer for 5 minutes until hardened. While bottom layer is setting in the freezer, combine nut butter, honey and vanilla extract in a separate bowl to prepare your filling. 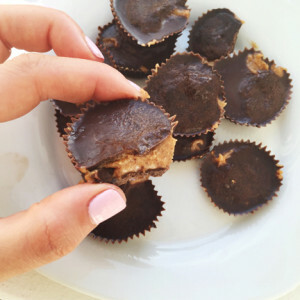 After the bottom layer has hardened, remove from freezer and add 1 teaspoon of your nut butter filling to each cup and smooth out with the back of a spoon. Add the rest of the chocolate to each cup until filling is covered. Place in freezer for 15 minutes or until cups harden and then you’re done! Store in fridge or freezer. These are suggested recipes that work for me, but always remember to consult your physician first if you have concerns about integrating chocolate into your daily meals. If you have any questions about the above, please let us know by clicking on “Leave a Reply” at the top of this post. This entry was posted in Blog and tagged Chocolate, Chocolate Bliss Balls Recipe, Chocolate Zucchini Waffles, Dark Chocolate Peanut Butter Cups, gluco perfect, Healthy Chocolate Recipes, high blood sugar, joy mernone, low blood sugar, Michael Murray MD, Recipe with rolled oats, type 1 diabetes, type 2 diabetes, Valentine's Day, What is the right type of chocolate to eat for diabetics, Whole Foods Coconut Oil, Why eating chocolate every day is healthy on March 8, 2016 by Gluco Perfect. For the past five years my boyfriend Kris has been so supportive of my diabetes. He gets me coconut water or a bowl of fruit when I’m low. If I test my blood sugar, he always asks for my numbers and if I’m cranky, the first thing he says is, “test your blood sugar, you might be high”. Even though for the majority of our relationship he has been more than caring and understanding of the challenges that come with living with this disease, he wasn’t always. And the reason for that is because for the first two months of our relationship, I didn’t give him the opportunity. Sharing with family and friends that you have Diabetes is one thing, but telling someone with whom you are just starting to date, that’s a whole other ball game. Kris and I began dating our senior year of high school and for the first two months of our relationship, I did my best to hide my diabetes from him. I made sure my insulin pump was always hidden in my clothes and I always went to the bathroom to test my blood sugar. I was extremely fearful that he would reject me for having a disease. One Saturday night after dinner we came back to my house and I decided to break the news to him. All throughout dinner I was playing out in my head how I thought the conversation would go. I believed it would end with him being embarrassed to be dating a girl who had something wrong with her. It was like a weight was lifted off my shoulders. I wasted months of freaking out for nothing! I think that this is a really strong point that Tracey makes. If we accept ourselves fully, we can then open up and allow our significant others to accept us fully as well. In the small chance that your partner thinks less of you because you have diabetes, that may be an opportunity for you to reevaluate whether this is someone with whom you want to share your time. If you’ve ever felt nervous or fearful to tell your significant other you have diabetes, you are certainly not alone! But the lesson here is to give your partner the opportunity to be supportive and understanding. Chances are, telling them will go a lot smoother than you can imagine and it will even bring you two closer since you are sharing such a big part of your life with them. How long do you think is enough time to wait before telling your significant other you have diabetes? Can you relate to these fears above? Let us know. This entry was posted in Blog and tagged being ashamed of diabetes, being scared of diabetes, being strong with diabetes, coconut water, dating and diabetes, diabetes, diabetes forecast magazine, diabetic test strips, diabetics, fruit, gluco perfect, Glucometer, high blood sugar, holistic health coach, how to be supportive of someone with diabetes, how to cope with diabetes, how to tell your significant other you have diabetes, joy mernone, lauren bongiorno, living with diabetes, love and diabetes, low blood sugar, sharing diabetes news, testing blood sugar, type 1 diabetes, type 2 diabetes, valentine's day and diabetes, yoga and diabetes on February 12, 2016 by Gluco Perfect. 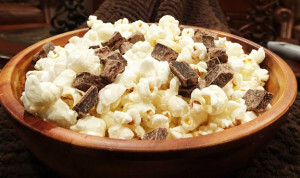 In light of National Popcorn Day that recently passed on January 19th, I thought I would share one of my favorite snack recipes. A few years ago I read that popcorn is actually a really great snack for diabetics because of the high fiber content and low glycemic index. I always found however, that when I went to the movies and got the popcorn they sold there or made popular brands of microwave popcorn at home, my numbers would skyrocket to the 300’s hours later. When I started becoming more passionate about nutrition and looking deeper into what was really in our food, I learned that even though popcorn in it’s natural state is healthy for diabetics, the one sold at the movie theatre and most ones you pop in the microwave at home are extremely processed. They are filled with hydrogenated oils, artificial flavoring, sodium, TBQ (toxic chemical), and loaded with butter. It’s actually a diabetic nightmare (and really a nightmare for anyone)! If you prefer pre-packaged popcorn, I recommend going with these healthier alternatives: Skinny Pop, LesserEvil Buddha Bowl Popcorn, or Tree of Life (yes, a healthy microwavable brand). And if you’re looking to take it a step higher, see one of my favorite recipes for popcorn below! Since popcorn and movies go together, like peanut butter and jelly, I recommend portioning out 3-6 cups of popcorn for yourself in a small bowl. That is equivalent to about 15-30 carbs, and that way the movie doesn’t distract you and lead you to overeat. Heat a pot over medium heat. Add coconut oil and let it completely melt. Once melted, put a few kernels into the pan and wait from them to pop. Once kernels pop, place the rest of the popcorn kernels into the pan and cover. After kernels begin popping, begin to shake every 10 seconds or until you hear popping slow down. When popping slows down, remove the pot from heat and continuously shake for 15 seconds. Pour it into a bowl and top with sea salt and melted dark chocolate and enjoy! Are you a diabetic who loves to eat popcorn? If so, try this recipe and let us know by clicking here how you like it! This entry was posted in Blog and tagged Blogger, Bootcamp Instructor, Control Solution, diabetes, gluco perfect, Glucometer, Glucose Monitoring, Integrative Nutrition Health Coach, joy mernone, Lancets, lauren bongiorno, Meters, Motivational Speaker and Type 1 Diabetic, National Popcorn Day, Test Strips, Type 2 Diabetic, Yoga Instructor on January 27, 2016 by Gluco Perfect. “Thank you to Fox Carolina for permission to link to the coverage about Dabo and Callie. It is very fulfilling for me to be able to learn and share new information to help individuals with diabetes live life to the fullest,” Joy Mernone, CEO & President of Gluco Perfect®, LLC. Click here to link to article from Fox Carolina (Meredith Corporation) written by Amanda Shaw. 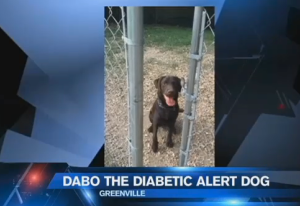 This entry was posted in Blog and tagged blood sugar, dabo the dog, diabetes, diabetic alert dog, type 1 diabetics, type 2 diabetics on January 20, 2016 by Gluco Perfect. 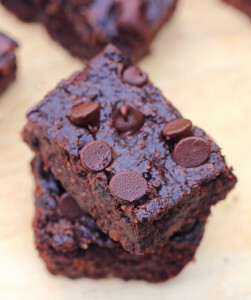 5 Healthy Holiday Tips For Diabetics + Brownie Recipe! The hot topic that has come up with my clients these last few weeks has been how to stay healthy during the holidays. The holiday season poses some common challenges that for diabetics can be detrimental to blood sugar control. It seems that with the all the parties, food temptations, and mindset of “I’ll start January 1st”, all intentions of exercising, eating healthy, and sticking to your normal routine tend to get swept away. When we focus on taking care of ourselves, we are more likely to make healthier decisions. One thing we want to do this holiday season is arm our bodies with sleep, water, and exercise to help reduce stress. When we are stressed, our body produces more of the hormone gherlin and less of the hormone leptin. Together these hormones result in us wanting to eat more and feeling less satisfied after we eat, which in turn can lead to late night binges and high blood sugars throughout the night. For diabetics, the danger zone happens when blood sugar is high for an extended period of time. It’s imperative that we go to bed at a stable number and know that it won’t be fluctuating too much throughout the night. By eating your last meal 3-4 hours before you go to sleep, you’re able to monitor how your dinner effects your blood sugar even hours later and make a correction if needed. On the morning of a party, I like to intention set. With your intention set, you have an internal compass that will help guide you. Think about the difference and outcome of an intention such as: “I want tonight to be about slowing down, connecting with my family, and not using food to feed my emotions” versus, “ It’s only one night I might as well eat whatever I want.” You’re definitely more likely to get yourself in a little more food trouble with the second intention! What the mind believes, the body does. Isn’t connecting with your loved ones the whole point of the holidays? Instead of hovering over the kitchen and stuffing your face with food, feed your hunger for enjoyment with laughing, telling stories, and playing games with your family and friends! Because I’m a total dessert person, I love trying out new recipes that takes a traditional unhealthy snack and makes it healthy. So many desserts are really high in carbs AND fat, which is a terrible combo because it makes your body more resistant to the insulin, which results in high blood sugar and fat storage. There are endless healthy recipes online but today I want to share with you my all time favorite! It’s always a hit at my holiday parties and people can’t believe it’s healthy! Check it out below to see the secret ingredient! Cool for at least 10 minutes in the refrigerator and then serve cold or warm with a glass of almond milk! Join the conversation by clicking here or on “Leave A Reply” at the top of this post and let us know what has been your biggest struggle with staying healthy during the holidays. Which tips above do you think you will try this year? Let us know! This entry was posted in Blog and tagged bean brownie recipe, controlling blood sugar levels, diabetic treats during the holidays, holiday eating tips, holiday eating tips for diabetics, self-care, treats for diabetics, type 1 diabetes, type 2 diabetes, when to eat your last big meal of the day on December 23, 2015 by Gluco Perfect. *The above statistics are cited from the American Diabetes Association, 2015. In honor of this November’s American Diabetes Awareness month, the ADA is holding a campaign to STOP DIABETES. They are gathering up as much support as they can for diabetes research, advocacy, and community outreach in order to help spread the message that all of us need to take a stand against this disease. Start the awareness at home by talking with your family about the importance of healthy blood sugar levels. You can also discuss the difference between type 1 and type 2 diabetes and stress that type 2 diabetes is preventable by keeping a healthy diet and exercising. Join JDRF and ADA in one of their walks that are held nationwide to fundraise for education, research, and advocacy. You can register to join your local JDF ONE walk or ADA Step Out: Walk to Stop Diabetes. Once called “Adult Onset Diabetes,” Type 2 diabetes now affects a growing number of children’s lives. One way to help support children is to work with your local school to invite a health care professional to speak about diabetes. Another suggested is to help the district get less fried food and added sugar in the cafeteria and more fresh fruits and vegetables. Become a motivator in your community and organize a walk or workout with a group of people to help each other stay accountable! When you take the time to come together with like-minded individuals working towards similar goals, you get a support system and realize you’re not the only one out there with the same issues and concerns. The idea is to create a sense of unity that is about joining forces to help each other through the challenges of diabetes and fight against the disease. November 14th was World Diabetes Day but let’s not let that stop us from continuing to raise awareness and giving support to those who need it each and every day of the year! This entry was posted in Blog and tagged American Diabetes Association, blood sugar levels, Community walks for diabetes, Diabetes Awareness, Diabetes education, Diet for Diabetes Patients, gluco perfect, lauren bongiorno, type 1 diabetes, type 2 diabetes, World Diabetes Day on November 24, 2015 by Gluco Perfect. 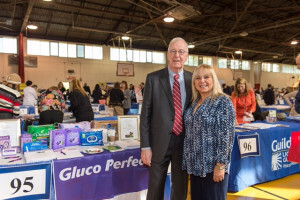 Joy Mernone, CEO & President of Gluco Perfect® participated in Senator Kemp Hannon’s Senior Health Fair event on October 8, 2015. This event is held annually and the primary goal is to educate seniors in the Garden City, NY community about products and services available to make their lives easier. “The Senior Health Fair was a well attended event that gave me the opportunity to connect with many seniors and educate them about diabetes. I even had the pleasure of meeting Senator Kemp Hannon of the 6th district of New York,” said Joy Mernone. 10-8-15—Sen. Kemp Hannon hosted the Senior Health Fair at St. Paul’s Field House, Garden CIty. Featured in this photo are Senator Kemp Hannon and Joy Mernone, CEO & President of Gluco Perfect. This entry was posted in Blog on November 24, 2015 by Gluco Perfect. Over the summer while working out in my yard, I heard a popping noise in my left knee. I instantly started crying from the pain and when I tried to straighten my leg out but couldn’t, I knew I had a serious injury on my hands. After a visit to both the emergency room and an orthopedic doctor, I learned that I sprained my right lateral collateral ligament pretty badly. I was told that I needed physical therapy twice a week for the next 3 months and needed to drastically modify my workouts so I wouldn’t further injure my knee. If you’ve ever been injured, you know how frustrating it can be. As a result of the injury there are a lot of limitations and a lot of precautions that more often than not interfere with your daily routine. Once the doctor told me of my injury, however, my first thoughts were not about what I couldn’t do, but rather what I still could do. In the weeks recovering form my injury, instead of running outside for cardio, which has high impact on your knees, I rode my bike and used the elliptical at the gym. Instead of my intense power yoga sessions, I focused more on slow deep stretches and meditation. And instead of leg days that usually consisted of lots of jumping and heavy squats and lunges, I focused on building my upper body strength with exercises like pull ups, pushups, shoulder presses and tricep dips. Even though I could not work out as hard as I normally would have, I knew it was so important to stay active to keep my blood sugar levels from spiking and to keep my stress levels low. It didn’t matter that I wasn’t running 10 miles a day or squatting with heavy weights. All that mattered was that I was moving my body and staying active, using what I had to do what I could because every little bit makes a difference. You may not be able to control what happens to you but you can control how you react. Once you can accept the challenge that has presented itself, you can begin focusing on seeing the positive in a situation and cultivating strength to help you get through it. When a new challenge presents itself there may be frustrating times, but the important thing is to be patient. To know that the moments of struggle are not permanent, and they will pass. Above all, we must believe that challenges are not meant to be roadblocks, but only bumps in the road. No matter how many bad days you have, or moments of self doubt and sadness, or no matter how many times you get knocked down, the important thing is that you get right back up and keep fighting to be the healthiest and happiest you. This entry was posted in Blog and tagged blood sugar levels, exercise, exercises for diabetics, lauren bongiorno, patience, perseverance gluco perfect, type 1 diabetic, working out with an injury, workout modifications on November 12, 2015 by Gluco Perfect. No More Excuses: 3 Steps To Start an Exercise Routine That Will Stick! Aside from the food you’re putting in your body, exercise is a KEY component to keeping your blood sugar numbers in a healthy range and in avoiding those high spikes us diabetics tend to get in the morning and after meals. One of the most beneficial effects exercise has on diabetics, along with everyone else as well, is that it helps the body increase its insulin sensitivity. A higher insulin sensitivity is SO important because it allows the insulin to take the glucose out of the blood in a quick and effective manner. When the body has poor insulin sensitivity, there are an array of negative effects that may occur: inflammation in the body, reduced athletic performance, low energy, increased risk of heart disease, weight gain, and may result in eye and feet problems. While everyone knows that exercising is healthy, sometimes we let our excuses get in the way. We know them all too well: I’m too tired; I had a long day; I have a headache; My blood sugars weren’t good today; the gym is too far of a drive; I have to cook dinner for my family tonight. The list is endless! Instead of viewing working out as a job or something you have to do, change your perspective and look at it as something that you GET TO do. You might not be able to control the fact that you have diabetes but you do have the ability to take better control of your blood sugar numbers through moving your body! It’s also an added bonus that working out boosts our mood, increases our energy, and gives us a sense of accomplishment! TIP: There are a million excuses we can make to not workout. Try writing down a list of reasons you want to work out and hang it somewhere you can see every day! Step two is to make a plan. Just like you schedule in work meetings, allot time each day to get active. On Sunday night I like to write out in my planner what workouts I’ll be doing each day and when. Whether it’s riding your bike outside, going for a run, circuit training, a spin class, a zumba class, dancing, make it part of your weekly routine! Note, before starting any exercise routine, please consult your physician. Journaling is a great way to not only help you track your progress toward a particular fitness related goal, but writing can help improve your connection between the mind and body. At the end of the day, reflect on how you felt after your workout. Did you have more energy? Were you able to do more cardio than the week before and felt a sense of accomplishment? Did your cravings for junk food increase? Decrease? When we reflect on how the body is feeling, a connection is formed between our actions, and the result of those actions on our overall health. TIP: Keep a notebook next to your bed and take 10 minutes before going to sleep to reflect. What I love most about these 3 steps is that they’re simple, but completely manageable! They’ve made a great impact on my life and I hope that they will help you as well! Share with us below how YOU stay motivated to workout! We’d love to hear! This entry was posted in Blog and tagged diabetes, exercise, gluco perfect, health and wellness, joy mernone, lauren bongiorno, type 1 diabetes, type 2 diabetes on October 2, 2015 by Gluco Perfect. Copyright © Gluco Perfect Inc.